Speaking in front of people is not always easy for me. Even with two decades of experience and a deep joy once I get started, speaking publicly still takes my breath away at times. 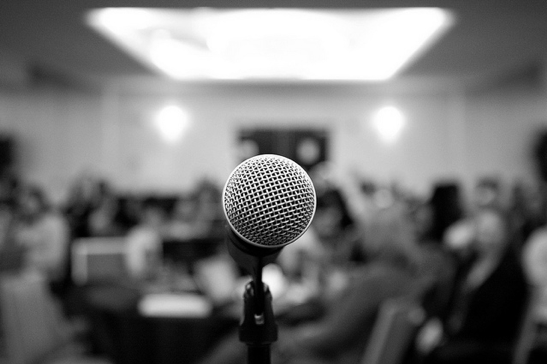 Anyone who has given multiple presentations can tell stories of horror from a public speaking moment. Once, in Baltimore, after a two-hour interactive presentation with a group of 30 people, I realized, after I had finished, my zipper had been down the entire time. Those moments tend to stick with you and add to the anxiety of being in front of people. Over the years, I have learned a few key principles to reduce the nervous fear of speaking. When I keep these simple ideas in mind, my ability to provide a meaningful impact increases. Pro Tip: Showing empathy begins with vulnerability and transparency…people want to know you are people too. Sharing stories of appreciation and gratitude is one way to show vulnerability. Because of our need to connect, we have this wonderful capacity to communicate through stories. The best storyteller owns the room. When you hone your craft for telling stories, you will reduce your fear in front of the room. Pro Tip: First, watch your favorite comedian with the sound off to learn the subtle technique of non-verbal storytelling.Second, listen without watching, and pay close attention to the timing and tonality of the message. Confidence comes from conviction. Reducing the fear from the front of the room comes from being the master of the message you are delivering. When it comes to speaking, I am not a fan of the adage, “fake it until you make it.” True confidence comes from your conviction in your message. Know what you know before you go. Pro Tip: Mark Twain once wrote, “I’m sorry I wrote such a long letter; I didn’t have time to write a shorter one.” Learn to communicate your message in less than 15 minutes…this forces you to find the true premise of the message.